Your Website Mobile Friendly In 30 Days. We make "going mobile" easy, fast, secure... and your web team won't have to change a thing. Optimize your existing website for hundreds of smartphones. Handle all the work. No engineering or design changes required on your end. Update your mobile site automatically and immediately when the content on your desktop site changes. Make your website graphics shine on high-resolution displays. Future proof your mobile site. With new mobile phones coming out every week, we keep up with change - so you don't have to. "We are very happy with your work... I will recommend Mobile Web Up whenever the opportunity comes up!" "How was the process of working with Mobile Web Up overall? FANTASTIC! I highly recommend Mobile Web Up, without reservation!" "I nearly flipped because I knew if I was having trouble loading my website [on my phone], so was everyone else... They worked remarkably fast. 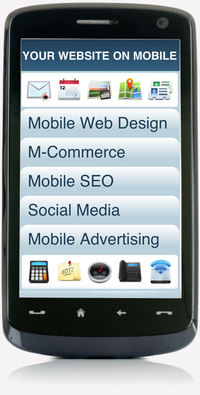 I highly recommend asking Mobile Web Up to make your website transition smooth and easy to the mobile universe."